Let that be the foundation and you'll see humility. Start with humility and you'll see authenticity. Let those be your guide and you'll have paradox. Real paradox. Start with paradox and you just might have something that's sustainable. I search through my blog reader one summer afternoon and glance at the deafening sound of the echo chambers. "Here are twenty-five badass apps that will revolutionize your classroom!" "Let the kids make decisions for Christ sakes. We need to unschool. Liberate the factories." "We need PLC's. Let us make wise, data-informed, research-based decisions. Only then will we have schools that truly improve." "Charter schools are the only answer. The innercity is filled with mediocrity. We need to reform these places with the flexibility that charter schools offer." Lots of bold answers but not too many questions. I walk outside and feel the grass beneath my bare feet. I meander toward the the garden. The tomatoes are turning a bright, bold red. Tonight they'll transform into a marinara sauce. I didn't earn it. I didn't create it. But it grew. Naturally. The boys beckon me to a mudhole in the yard. They grow and explore and make sense of their world and it's messy, really messy. We clean up and read books and it's tidy. Then it's back outside where they climb a tree. Should I tell them they're going too high? I have no idea. I vascillate between too much freedom and too much safety; too much direction and not enough support; allowing them to live in the imagination and helping them to see their physical world. I don't know what I'm doing as a dad. It's shrouded in mystery. It's full of paradox. But I have a hunch that if there is a "right way" it's the path of love. Not insipid love. Not Hallmark love. Gritty love. Messy love. Muddy love. A month later, I'm in the classroom. I don't know what I'm doing. I have plans. I have knowledge. I have six years of teaching experience. I have a resume that looks impressive. But the present reality is mired in paradox. It's messy. It's confusing. I meander between too strict and too lenient, too much freedom and too much safety. I'm not a pundit. I'm not an expert. But I have a hunch that if there is a "right way" for my students, it's the path of love. Real love. Messy love. A twenty-first century education needs to be innovative while listening to the vintage voices of the past. It needs to include creativity while still providing a framework for some common skills. It needs to respect the balance of freedom and safety. It needs to understand the complicated and complex human condition. It needs to be a place that respects the local community while still engaging the larger world. Those are huge challenges with complex ideas. I don't pretend to speak for anyone beyond myself and my own classroom. However, if I can approach my classroom with humility, motivated by love for my students, I think I'll be on the right path. Here's the scenario: You have been put in charge of creating a brand new education system. Whatever you decide will be done. You are the monarch. You have unlimited resources and everyone is mandated to do your bidding (and they love you and think you are a genius). And they are waiting to hear your concept. One caveat: This being the 21st century, you have to explain your entire concept in 21 words or less. So, let's hear what you've got. It has been a while since my last post, but there are good reasons for that, one of which I would like to take a moment and share. I teach at Digital Harbor High School in inner-city Baltimore. The school was founded in 2002 with substantial support from the Bill and Melinda Gates Foundation, and the objective was to take a failing school in southern Baltimore and reinvigorate it with a vision of 21st century education and technology to service inner-city students in the Baltimore City Public School System (how well this has or hasn't worked and what my thoughts are on Urban Education Reform I will be sharing sooner or later on this blog, no doubt). While Baltimore City Public Schools has been in the news recently for some pretty significant and progressive changes (such as graduation rates and a new teacher contract), these improvements have only recently started to turn the tide of more than 40 years of problems and a failing system. The neighborhood in which I teach is one of the more affluent neighborhoods in downtown Baltimore, but Digital Harbor was one of Baltimore City's first City School of Choice (meaning that students from all over the city can elect to attend the school regardless of where they live). As with other schools in the Baltimore, middle class families send their children to private or charter schools. This combined with the geographic dispersement of students means that substantial parent/community involvement has been a challenge. Some members of community around our school have, however, effectively adopted our school and our students as their own and while relationships with the neighborhood and the students (especially in the early afternoon after the bells ring) has definite room for improvement, a few members of the neighborhood have taken it upon themselves to make a positive impact. Last year these community members organized a fundraising event and in one night raised more than $50,000 for scholarships to students going to college from Digital. I became more involved this year when they came to the school looking for someone to help out with a website and other technical issues. The past few weeks have been a whirlwind for me trying to juggle everything from teaching to web programming to finishing my Master's degree at Hopkins. I wanted to write this post for two main reasons. 1) a follow up to the last post I wrote about teachers knowing HTML. While what I have done for the DHHS Alliance has gone beyond simple HTML knowledge, I feel strongly that the more teachers teach themselves about technology the more value they can add to their school and the more they can make a lasting difference in the lives of their students (both in high school and beyond). I know some individuals disagreed with my last post, arguing that Web 2.0 has effectively reduced the need for teachers or anyone to actually know HTML, but I still feel that for those willing to make the investment, there will be significant payoffs. Better to program than be programmed (in the words of Douglas Rushkoff), especially if one adopts the teacher-as-leader model of education. 2) to invite you all to check out the website i've been working on and highlight some of the silent auction items that are available online. Nose Cone from Indy 500 race last year, signed by Helio Castroneves, Scott Dixon, Dario Franchitti, Dan Wheldon and others! The actual event will be at the Baltimore Museum of Industry on Saturday, the 26th of March. The biggest problem among many with your assessment is that once education is a video delivered system (oh the desks will still be there), the state can create a curriculum that limits vision to a single narrative. To imagine that the state would not do exactly that is naive in the extreme. The world isn't available for everyone's success. Look around you. It's a pyramid and in order to keep the largest portion of the population in place, you need them to be compliant. Young entrepreneurial teachers at the top of the food chain are all about their contribution to education via zuckerberg fueled start up fantasies and it's a whole new world paradigms. But they aren't really paying attention to the structure of the system or the lack of opportunity possible for the largest mass of the population. It's a ponzi scheme. I love technology, but it won't save us. Wine AND Cheese. Laurel AND Hardy. Mick AND Keef. Lennon AND McCartney. The best things in life compliment one another. And so it should be with Analog AND Digital. The new paradigm shouldn't be about exclusion. It should be about dynamics. We don't exclude Paper because we include Digital. Rather, we strive to exclude the static modes of thinking often represented by paper -- but also easily represented by poorly-used digital. The new paradigm shouldn't be about closing down schools and taking learning exclusively online. A computer screen will never replace a football field. A smartphone will never replace a theater. A Skype chat will never replace a high-five. But neither will arguments berating tech alter the fact that digital tech is the context of the present and that we owe it to our kids to educate them in the world in which they find themselves living and not in the world some of us may wish still existed. And so we look to augment one with the other to the exclusion of neither. We seek to bring the speed and democratizing openness of the digital to the solidity of the analog and bring the warmth and experience of the analog to the cool intelligence of the digital. Schools themselves are changing and they will continue to change. So let's use what we've got -- both analog and digital -- to the full benefit they both offer. We don't need a classroom in which to learn poetry. A tree and some shade will do. In winter, we can take inspiration from the museum school model and take the kids directly into the experience. In the meantime, use all that space in the old classrooms to do what those types of building do well: let them be labs, let them be community spaces. Turn your rooms into STEM innovation centers. Let the science loose. Let the math live and let it get messy. Use your on-site tech and know-how to train, empower, and embolden the children AND adults in your community. While we're at it, create those partnerships with museums, historical societies, libraries, state parks, local farms, and public institutions. Spend Mon, Wed, Fri in the lab and Tues and Thurs taking in Van Goghs, or farm animals, or new friendships and alliances through community outreach. Teach English by reading about whatever it is that you are doing. Make art on the move and in the field. Learn history by learning how to talk to strangers; make new friends who are not like you, and listen to perspectives different than your own. Keep those smartphones handy all the while. Turn lab time into bring-a-scientist-to-school time. Turn math into a worldwide problem solving mission. Pull out that smartphone and turn a stroll through the art gallery into an augmented trip through history. Try things out. See what happens. Bring the Analog and the Digital together. The life of the heart and the life of the mind. The mathematician and the poet. Enough with the idea that one thing excludes another. The only thing worth excluding is fear. Fear, ignorance, and banality. Write that out on a Post-It and stick it to your monitor. Does/should school meet the demands of the job market? - Develop socially engaging experiences to create stickiness and loyalty. - Use Smart Monitoring Tools for action-oriented insights from all social media outlets: pages, sites, blogs, etc. - Use Smart Management Tools (TweetDeck, etc.) to manage the communities effectively. Just for fun, would love to hear from you all about what kinds of skills and intelligences you see needed for this position and what kind of teaching and content best prepares a student to enter into a job market where this is a job that would produce a substantial income. For you overachievers: Does/should school meet the demands of the job market? KQED's MindShift ran a piece today that I wrote in response to the idea that my 21 Things That Will Be Obsolete in Education by 2020 was a list of impossible tasks. We’re not talking about computers anymore. We’re talking about the way that we connect to one another as human beings. Don’t let the reality of whatever condition your school might be in right now dictate what reality will look like in the future. Shape the future you want to see. Check out the piece and please comment; discussion is energy. Social media is having an incredible impact on various aspects of our lives. Recently, CNN and the Huffington Post reported the impact of social media during the recent tragedies that have struck Japan. The underlying message was that social media has allowed people to communicate important messages through powerful real-time images and sharing their experiences. With Twitter, Facebook, and YouTube alone we have the ability to spread a message and impact an audience of millions worldwide. We have the ability to impact our world in a positive manner. Visuals are powerful as are stories shared through multimedia. In a series of posts, we will explore various ways to spread a message through various social networks in order to transform current education systems. This is also research for an upcoming Keynote that I will be giving for the Plymouth E-Learning Conference in April. Why Try to Spread Your Message? Education is one of those hot topics. Everyone has an opinion because everyone has experience with the education system. Powerful stories and messages are already being heard by millions regarding education. You have heard the ones spread by Oprah, Michelle Rhee, John Legend, and various presidents, prime ministers, and leaders worldwide. These are the most prominent messages that have impacted wide audiences. Waiting for Superman was a documentary heard by millions that basically shared powerful stories. The audience was motivated by these stories to act. Education policy was impacted by the stories shared in this documentary. What is missing is the voices of educators who are already transforming the way their students learn. We live in educator communities where we witness the beauty of what our colleagues are accomplishing with their students, but outside this community lies the general public and people who decide education policy and they rarely hear about the amazing learning taking place. We need for the stories of educators impacting education in a positive way to go viral and drown out the other voices negatively impacting education policy and hindering transformation. In 2005 YouTube was created and is still one of the best tools for spreading a message. Web Monitoring reports that in 2010 Youtube exceeded 2 billion views a day which is double the prime-time audience of all 3 major US broadcast networks combined. Educators have a free powerful tool that attracts audiences worldwide to spread their messages about what they believe learning should look like. Can an educator's video go viral or even be heard by large audiences? Yes! Scott Mcleod's and Karl Fisch's Shift Happens videos have been seen by over 20 million people worldwide. Their message about the importance of effective technology integration has impacted many schools worldwide. So how do you spread your message through video? What message will you attempt to spread to transform education? Also posted on my Teach With Video blog. Last week I presented at the KORCOS conference in Korea about my experience having a paperless classroom this year, and my recommendations to teachers who are thinking about moving toward eliminating paper from their classes. 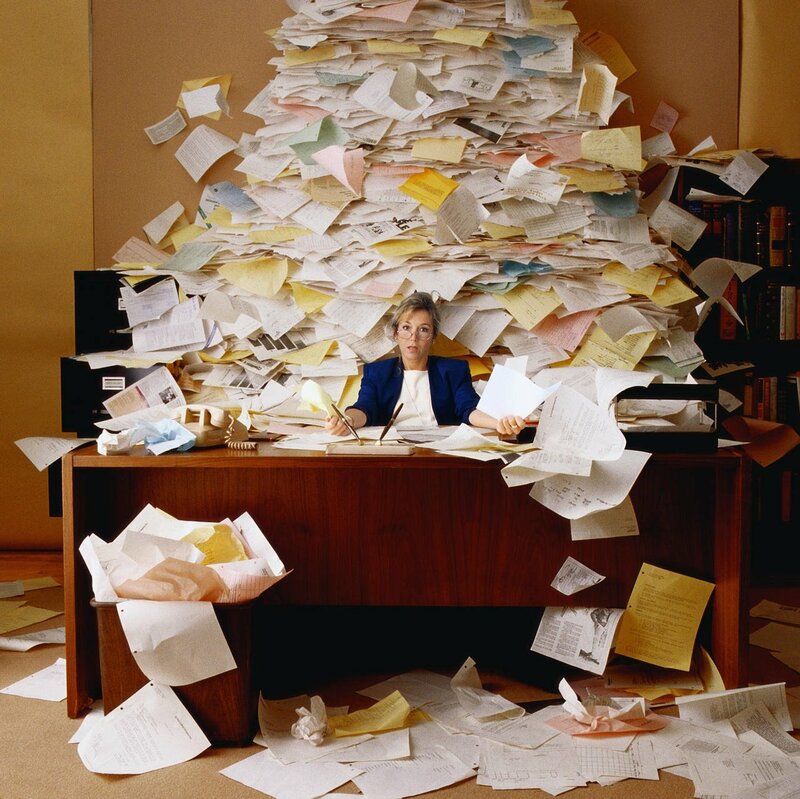 Teaching paperless isn't as difficult as I thought it would be, and we have not used paper in my class this year. But after a conversation I had a few days ago I think it's time to get some of my thoughts out there for reflection. I totally get passion in education. And really can you be an educator and not have passion for education? Perhaps that is a post for another time. But the way I see it, many have moved passed passion and moved to anger. Again, I totally get that. I am upset with many things in our current system. Sure, if asked, I would give a lot of the "reformers" a piece of my mind. It seems like if you disagree with one side or the other you are perceived as dumb, stupid, or much, much worse. My conversation started out with a Tweet that (to paraphrase) asked if a certain, central figure in the reform debate, that many admire and look up to actually had any ideas or if she just ran around the country telling us what is wrong without actually offering up any ideas. I follow this "reformer" on Twitter and her stream is filled with what comes across in 140 characters as anger. Again, I get that. (Remember, I am angry too.) But my point was that when you had the audience she did last week why not give them something tangible to take back to their districts to try or do? Seems reasonable, right? So after my tweet, which I figured would draw some comments I got plenty of, "I agrees," and a few people who disagreed, which was great. I had fun engaging and talking to them. Then there was one who, has passion, but that passion has grown to anger. And if you cross them, say anything negative about the reformer whom I mentioned earlier, well, you might as well pack up and go home. This tweeter had solid arguments for certain types of reform and the direction we should be going; with many of these arguments I agree. However, it was the personal attacks and just general poor language that really made me lose respect for this tweeter. Disagreement is cool. Makes us think differently and see other sides, but to move from disagreement to creative hashtags, none appropriate to even write here, really just make your arguments look weak. This isn't the first time I have written about this or even encountered it. In a post from late last year I wrote about Education Nation project from NBC and how it was getting all sorts of negative attention from the Twittevers and blogsphere. Again, there I tried to say we needed to move from talk to action. In the most popular post ever on my blog I wrote about why we should all think before we Tweet. For me I keep coming back to this idea that I believe people who use social media or tools like it feel some level of anonymity and they can say, really what ever. What if we were having a face-to-face conversation? Would the person who I had my conversation with this past weekend behaved the same and said the same things? I am doubtful. What do we tell kids about comments on blogs, online articles, Facebook status updates? If you disagree, you can do so without attacking another person’s character. If you wouldn’t say it in person, don’t type it online. Remember, there are human beings on the other end. Remember, you are also a human being. Rule #1 is really all you need. So why so much animosity amongst educators in online spaces lately? I would say that the current turmoil in which we find ourselves (perhaps related to education reform discussions) is part of it. But are we practicing what we preach? I don’t think so. Couldn't agree more Michelle. And Seth Godin had a piece a few weeks ago where this last line says simply, "Anger, on the other hand, makes us smaller." We are going to disagree. And you know, that makes us smarter, pushes our thinking and helps us see all sides. But is it possible to do it without anger? Passion, sure. But anger? What do you think? Is this a problem today? Is it a result of the anonymity I say the screen provides or is it something else? "Can I use a pencil?" "Do you have a piece of paper, Ms Hertz?" "Can I just please write it down, Ms Hertz?" I get these questions in my lab from time to time. My answer is always, "No," provided the student is not writing down a password or URL to take home or if the student has an IEP or other individualized learning plan. I answer that my job is to teach them how to use technology instead of paper to solve problems and organize ideas. I am showing them a different tool to use--one that I believe will be ubiquitous by the time they are my age. One that they are already at a disadvantage with because of access at home and lack of proper instruction in the past. It is my belief that my students will be required, like no other generation has in a long time, to replace some of the tools we have grown accustomed to with new tools that often do the same job, only more efficiently and often better. With these tools comes new responsibility. See, not only am I teaching kids how use computers to do more than search YouTube and play games, I am also responsible for sending good digital citizens out into the world. More and more conversation and interaction between people is moving online, and children are joining those conversations at a younger and younger age. Just as teaching with just a pencil and paper no longer suffice, teaching courtesy and manners face to face no longer suffice. While both are an integral part of our formative years, we cannot stop there. Students who cannot type or navigate a computer will be left behind. Young adults who have not learned how to conduct themselves online will have dire consequences--some immediate, some later in life. I am charged with making sure that my students leave my classroom prepared to engage in an online world in a meaningful, collaborative and respectful way. It is my job to give them the technical skills and the social know-how that will help them navigate their futures. The students on our school's newspaper do a bang-up job. They tend to be the kids I see working early in the morning and late into the evening as teachers are closing up shop and the maintenance crew is getting to work. And they put out a good paper, both in print and online; I'm especially fond of the opinion pages (go figure). Check it out at: http://www.jcpatriot.com/ and follow them @JCPatriot on Twitter. I bring this up not just as a plug for our school's paper, but because I see student run media -- especially online and connected student run media -- as a perfect form of hyperlocal journalism. I think there is a lot to be learned from how student writers and editors cover their "local market" and in the ways they present their findings, investigations, observations, and opinions to the wider world. I would love to see a connected and organized student run media network develop online -- something that could connect student journalists in hyperlocal markets throughout the world... something with a tag like #studentmedia or #hyperschool or #k12voice. I would love to help our students connect with other student journalists out there; if you've got leads, leave 'em in the comments. And thanks. Here's a bit of one of the most popular posts to appear on TeachPaperless over the last few months. On a personal level, it was also a big reinforcement in my mind as to why networked learning is so valuable. Check out the original post for the full story. Click here for the full account of how our network helped us verify and extend what we learned in class. Just wanted to highlight an awesome web 2.0 tool that I started to use after a conversation with a fellow teacher on Twitter (#edchat). It is called uJam and it allows a person to create a free account to make free songs. I have zero musical ability (I am not lying... it's pretty bad), but this site does not care about my lack of musical ability. There are four different ways to use the site for music creation; the way I used it was simple -- I recorded my voice. My focus was giving directions for a test. After I finished recording (and I did attempt to sing a little) the site was able to sync my voice and speed to a variety of background music options. I was able to change the style of my voice, the tone, the pace, and so much more. It was awesome! If you do have the ability to read notes... well... still check it out as you can manipulate certain features to make your songs sound better. My students thought my song was dorky, but sometimes that is the role of the teacher in order to gain some interest. Have your students play around with the site. They will love it and it can be used for project creation. It has an endless amount of creative potential and your students can actually create a song of their own and save it as an mp3 file. Imagine your students with headphones on, but instead of listening to their songs they are listening to class-created music that will help them review/learn content. Discussion of Romantic poet Percy Bysshe Shelley's 'Defence of Poetry' today in history class turned into a conversation about the nature of imagination and a debate about whether or not schools demand imagination. 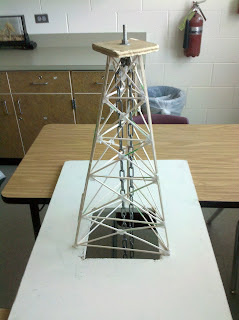 In my 8th grade applied technology class we do a unit where we build balsa towers. We start off talking about the history of building and architecture while investigating the strongest shapes that make up buildings. Students then research different design ideas on the web. We talk about the science concepts behind the project daily with opening discussions about force, mass, center of mass, loads, and buckling. Students draw their towers to scale measuring the angles and lengths to calculate whether or not they will have enough sticks to complete their design. After we break the towers students calculate whose tower was the most efficient. At the end I have had students write letters to our local mayor designing a tower for tourism or blog about their experience on our class blog. So we integrate math, science, history, and language arts into one project where students research, design, build, destroy, and evaluate. But this project lacks a few things that I would ideally (see my ideals listed here) like to see: not enough student choice, the projects all tend to look the same, and too much of the structure of the unit is pre-designed by me. So I would like to expand this idea to a larger theme that could be taught by a single teacher, perhaps in an elementary setting, or by a team of teachers at any level. I like the idea of "theme" better than "unit" because I envision the teachers having some idea of what will happen but the students influencing the process so that where it goes and ends up is open-ended. For starters it would be a theme on housing. The unit would look at what kinds of dwellings humans choose to live in. It would emphasize the political, social, economical, cultural, and environmental factors that influence these choices. I was originally going to separate these suggestions by subject area but they are too intertwined so I will just list some possibilities. This theme is designed to fit an "all day" integrated project not just a one hour class. Housing could be looked at in terms of the history of architecture from different countries, climates, and/or cultures around the world. Students could watch films like Garbage Warrior to learn about modern, environmentally friendly building methods. This film also brings up the problem of strict building codes limiting innovation. Students could analyze the role of government in establishing building standards and codes and influencing building policy through laws and incentives. They could look at the advantages of quality control vs. the disadvantage of limiting innovation. Students could study how the environment effects the shelter needs of humans in different climates. For example they could learn how and why Inuits chose to make igloos and Mongolians make yurts. Students could learn about recycled homes or innovative urban designs like this Chinese egg. Students could learn about differences in impact between single family homes and multi family complexes and even communes. Students could look at children's bedrooms around the world to compare differences in living standards. Students could learn about the millions of people who have no "home" but live in shelters, shanty towns, refugee camps, or even in garbage dumps. Students could learn how toxic or carcinogenic materials have been used in construction. Students could go on local field trips to view historic and/or modern architecture. Students could visit "green" buildings. Students could watch this TED talk about how the differences in engineering in Haiti and Chile led to contrasting results from the recent earthquakes. Students could interview architects, construction workers, and engineers in person or through Skype. Students could learn about differences between LEED, Green Built, zero energy, and passive home designs. They could analyze how much of these programs are political and how much of them are actually environmentally responsible. Students could analyze statistics about how humans live across the globe. Then they could create an infograph about how the choice of materials effects human health and the environment. Students could research the dwellings of indigenous people and compare them. Students could have debates whether modern or indigenous dwellings are better for human life and the environment. Students could perform energy audits of their own homes figuring out the volume and square footage of their homes and finding cost/ square foot to heat and cool their homes. Students might study an important architect such as Frank Lloyd Wright or a branch of design such as feng shuai. Every group of students would not do all of these things but different groups would choose the topics that are most interesting to them and even suggest other ideas. Some students might choose to branch off into related topics such as environmentalism, capitalism, architecture, interior decorating, sustainable native plants, etc. The directions this project could go are almost endless. Hopefully it is obvious that intertwined in all of these ideas is math, science, social studies, language arts along with art and technology. The cumulative project would be for teams to use what they learn to design, draw blueprints, and make a scale model of an ideal ecological dwelling (like this example). It may or may not look like a conventional house with conventional materials. It could be influenced from any of these activities from cultures around the world. Students would also have to provide a budget for the estimated cost of the materials of the home. They would have to show the energy consumed. Students would also present their homes to their peers (and broader audiences through social media) and describe the benefits of their models. These are my thoughts for a practical theme based on my key beliefs of the best practices of student learning. What are your thoughts? What would you add/subtract? How could this theme or a different one be used for student-centered learning in your classroom? I wrote this after reading a thought-provoking post on the Spicy Learning Blog. When I first began blogging, I felt like a lone Luddite in a techno-wilderness. While writing about the greatest "killer apps" (sadly, not nun-chucks), I wrote about the need for technology criticism. I'd cringe about a glassy-eyed description of the future class erasing the boundaries of time and space. It was pure arrogance on my part and I soon ran into Doyle's Science Teacher blog and saw the value of understanding the physical world. Using a more poetic, honest and narrative format, he managed to speak what I felt. So, I wasn't exactly a trailblazer as much as a tech critic on the wrong trail. However, I've noticed that it's become commonplace now to put pedagogy above technology. I constantly read retweeted lines about why the real magic is the learning and the students and the thinking. To say, "You shouldn't love technology, you should love pedagogy," is akin to saying, "You should love the points you made about Sufjan's newest album" rather than saying, "I really love getting a chance to sip coffee and have a conversation with Quinn." I expect an author to love his or her ultra-trendy Moleskin or retro typewriter or, God forbid, brand-new Mac Book. Similarly, I expect a guitarist to appreciate his sing-string companion. I expect any master of any art to love his or her tools. The point is to get past the novelty phase and love the medium, knowing all of its faults and understanding its limitations. I want to be grateful for the medium, knowing its power and potential without trying to convince myself that the tool will not change me in both good and bad ways. Last night I engaged in a few Twitter conversations ranging from the death of democracy to the bizarre cult following of Apple fans to whether or not the Supreme Court should allow bigots to protest at military funerals. They were intellectually appealing and somewhat fun. I had planned to work on editing my book, but instead I had the chance to ask questions, offer opinions and get involved in intellectual sparring matches with like-minded people. Yet, I kept feeling lonely. Something about feeling "connected" without the sense of space or tone or texture offered just enough personal connection to give me a hint of relational proximity without the authenticity that I would get from sharing a pint with someone. So, I switched to Hulu and watched an episode of The Colbert Report and then an older re-run of Modern Family. It was neither interactive nor relational. However, my thoughts were not limited to 140 characters and oddly enough I didn't feel lonely, either. It's because the television, as a medium, does not pretend to know me or interact with me. Instead, the shows offered a sense of story, context and commentary that had been missing from the Twitter streams. How do we recover the sense of space in our online interactions? Is this a common phenomenon to feel lonely when interacting online? How do we tell and listen to stories using media that are geared mostly toward short sound bytes? Does this mean that our own sense of narrative has been forever altered? Is there a balance we need between online interaction and traditional media? If television viewers don't feel as lonely as a Twitter user (perhaps too bold of an assumption), what does that actually mean? Is it possible that television (unlike Twitter or Facebook) is more dangerous in the fact that we rarely have a chance to feel the loss of space in our lives? What should compensation models look like in schools of the 21st century? What kinds of compensation should 21st century schools use to attract and retain teachers? Comment away... we want to hear your ideas. Show of Hands: Does the New iPad Meet Your Needs as a Teacher?